Redemptorist Father Lawrence Buckley, a champion of the rights of the people he served, died Saturday, Oct. 11, at St. John Neumann Residence in Saratoga Springs, NY. He was 84 years old. A Wake Service and Mass were offered in the chapel there on Monday, Oct. 13; a second Wake Service and Funeral Mass were held Tuesday evening , and 11 a.m. Wednesday, Oct. 15, at the Basilica of Our Lady of Perpetual Help in Boston, his home parish and the city he served since 1972. The son of John and Ann Kelly Buckley, he was born Feb. 12, 1924. He attended the parish grammar school, in the later grades joining a group of other boys being tutored in Latin because of their expressed desire for the priesthood. After graduating from OLPH School, he entered the Redemptorists’s junior seminary in North East, PA. He completed the six-year course there, made his novitiate in Ilchester, MD, and professed his first vows in 1944. He continued his studies at Mount St. Alphonsus in Esopus, NY; made his final profession of vows in 1947; and was ordained to the priesthood on June 19, 1949. According to a nearly lifelong friend, Father Peter Quinn of the Archdiocese of Boston, "Very early in Larry’s seminary formation as a Redemptorist, a statement by one of his professors laid hold of his heart for the rest of his life. The priest’s insight was this: the Church must be willing to suffer for the sake of the Gospel of Jesus Christ." Father Buckley took that passion for Christ and the Church into the mission fields. His first priestly assignment was to Puerto Rico, serving for three years in Mayaguez and then one year in San Lorenzo. Father Sylvester Feeley said: "When I Fr. Buckley, champion of social justice, dies at 84 was Vice Provincial in Puerto Rico, he was a champion of social justice. 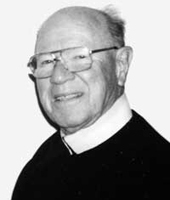 He loved to argue and there was no doubt about his views"
In 1955, Father Buckley began 12 years of service at Sts. Peter and Paul Church (now the diocesan cathedral) in St. Thomas, VI, for six years as a parish priest and six years as rector and pastor. Father Carlyle Blake, a native St. Thomian, remembered that the then Governor, Ralph Paiwonski, took the opportunity of Fidel Castro’s revolution in Cuba to promote the Virgin Islands as the new "tourist mecca of the Caribbean." However, St. Thomas lacked accommodations and the infrastructure to support them and immigrants from Dominica, St. Lucia and other islands were brought in to supplement the local work force. "The law then said that alien children could not go to public schools; Father Buckley wanted to make sure the children were being educated," Father Blake said. "As a good missionary, he met the needs of the immigrant children," building new classrooms for the parish school in whatever corner he could find, he added. "He was a no-nonsense pastor who knew what he wanted to do and did it … I have the highest respect and honor for Father Buckley for all the work he did in the VI." It was Father Buckley, too, who decided that mission preachers coming from the States not only preach in church, but visit people in their homes and invite them to the services. Bishop Emeritus Elliott G.. Thomas, the first West Indian Bishop of the Diocese of St. Thomas in the Virgin Islands, recalled Father Buckley’s kindness to himself and his family that led to many other blessings. "It was because of him that I went into business," Bishop Thomas said. As a licensed pharmacist, the young Army veteran was working as a government drug and narcotics officer and had no thought of opening his own pharmacy – no other business on Main Street was owned by an island native. As pastor of Sts. Peter and Paul, Father Buckley was looking for a tenant for a small building right next to the church. "He said, ’I want to help a native,’" the bishop explained, and offered to rent the space at half the rate he might have commanded from an outside owner. "That store was a blessing to me and my family for many years," Bishop Thomas said. In 1967, Father Buckley was transferred to St. Croix, where he was named rector and pastor of St. Patrick Church in Frederiksted. It was under his leadership that the church was renovated. From St. Croix, Father Buckley returned to Boston in 1972, where for the next 30-some years he became well known for his pastoral and civic service to the city. In that decade, parts of the city were in turmoil over the issue of court-mandated busing to achieve racial balance in public schools. Father Quinn said that Father Buckley’s "passionate mind and heart led him to work tirelessly for racial harmony and justice and Christ-like response to life’s complicated, complex issues. Larry was blessed with the moral courage and willingness to suffer for the Gospel and to suffer for God’s people when he addressed complicated social issues, such as housing in Mission Hill, busing in Charlestown, and racial integration." He never lost his concern with the education of children. According to Sister Teresa Prior, who has served at Our Lady of Perpetual Help School for 25 years, Father Buckley "was a wonderful friend, a really truly dedicated priest who visited the children every day." He taught religion to the first-graders and prepared the classes of children studying to receive First Penance and First Communion, she added. "If we had a situation in school, he would ask for the parents’s names and number. He would call the mother or father and invite them to the rectory, where he’d talk lovingly, like a father, with the parents. After that, there were never any problems with that student," Sister Teresa said. Father Buckley also ran the parish CCD program, was a strong pro-life supporter, and was faithful in visiting the elderly. He continued his service at Mission Church until the last few years of his life, when his need for nursing care prompted his move to St. John Neumann Residence. Father Quinn, reflecting on his friend’s life, said: "Lord Jesus, we thank you for his remarkable kindness, acceptance, understanding, forgiving, enthusiasm and dedication and so much more Ó all emanating from his grace-filled regard to Jesus Christ, to the Lord’s people and his Redemptorist community… We thank you, Lord, for the ways he radiated his hope and trust in you and gave passionate witness to that love in our world." Father Buckley is survived by a brother, James Buckley, one niece, Roseann Abril, and her husband Todd; two grandnieces, Bridget and Danielle Abril and one grandnephew, Owen Abril. Rev. Lawrence J. Buckley C.Ss.R.